I am now on Summer break! After teaching 3 semesters in a row I have 7.5 weeks off! 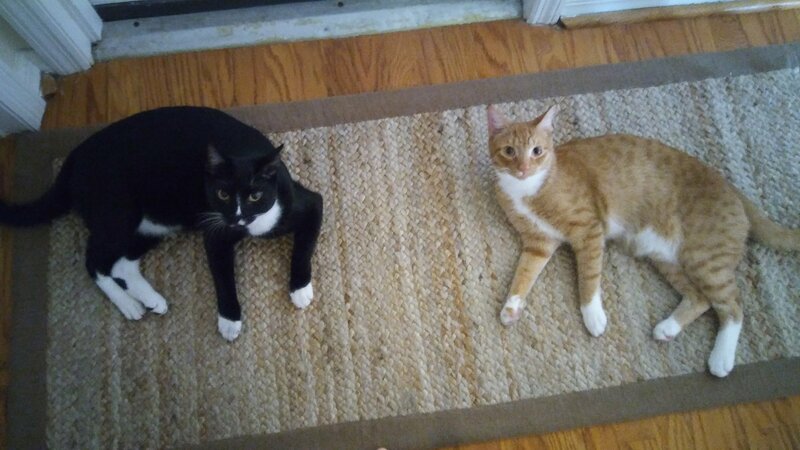 My friend gave me the above runner rug that matches a room size rug she gave me before. – I turned in and submitted all of my grades for Spring Semester on Thurs afternoon. They aren’t actually due until Monday but I am getting paid the same whether I work over 3 additional days or not so I work harder to get them turned in as soon as the finals are over. I believe my students appreciate it too. I now have 7 and a half weeks off. It’s amazing to have this time to rest, recharge and maybe travel but it is also over 2 months without a paycheck. – I took advantage of a deal on B1G1 free cereal that came with a free code for a free movie ticket. We were going to go to the movies anyways so this basically makes the cereal free. – We went to Dollar Tree and I was able to purchase more LED lightbulbs for $1, I also got 2 loaves of bread and 2 pots for my tomato plants. 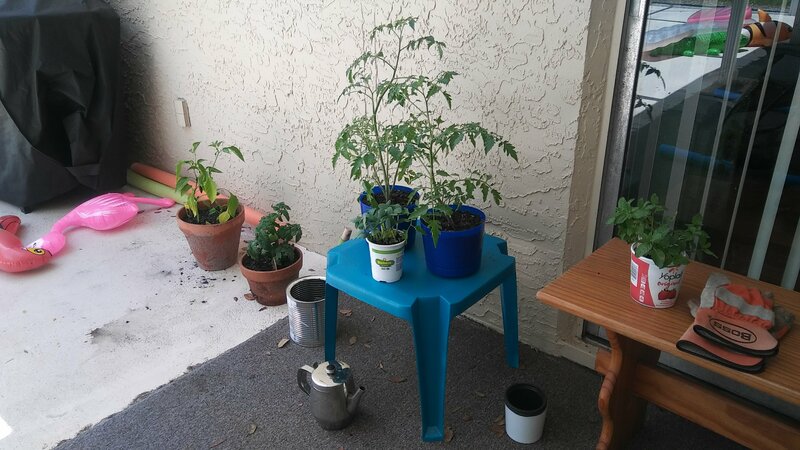 – This morning I repotted my tomato plants. The store was out of top soil but I found some in an old pot in the backyard. I can’t wait until we actually have tomatoes. – I had a return to do at Lowes for about $12. I noticed they were having a 5 for $15 vegetable plant sale and decided that would be a good use for the money. We now have a few more plants in our small patio veggie garden. The needed bigger pots right away but pots were expensive at Lowes so I made do by recycling some food containers and using some old pots I found in the backyard. The old backyard pots also had top soil in them so we haven’t had to buy that yet. – It’s just starting to be warm enough to enjoy the pool! We are excited! – My father gave us his cable login to use on a variety of Aps. We are able to watch cable for free! In exchange we shared our HULU login. – Went to lunch with my friends who are also professors. I was able to do a $7.99 lunch special that came with pizza, a salad and a soda. – My friends and I also seem to have a lot of stuff to exchange. I gave one friend a Christmas tree while another friend gave me books and a rug. Another friend gave my mom a printer. – Our poor cat who has the UTI already cost us $120 at the vet and may need to go back. We aren’t sure yet but really hoping she’s fine now. – We finally had to purchase $120 in flea and heartworm meds for the dog. The other prescription flea meds weren’t working at all. The price is similar but this is a lot to pay all at once. If it works there will be a savings in washing everything less and also not having to purchase separate heartworm medicine which can also be expensive. – We had friends and family stay the night on Friday and I thought I had purchased enough groceries for dinner. Unfortunately, at the hectic end of the semester my planning was a little off and we needed about $30 more in groceries. – Still gathering items from the house for a yard sale and asking friends to join me which makes it more fun. – I am gearing up my eBay and Poshmark online selling business for my 7 weeks off of work. – I sold a set of young adult books and mailed them off in a recycled box with tape my mother gave me for free. I try to get an additional use out of Amazon’s excessive packaging! – I sold another sewing pattern. I need to do more with this side hustle since it is passive income after the initial work. – Still need a new floor steamer but haven’t had any luck finding one.